Outdoors every day in sun, wind, and rain, with steady legs on a shifting deck, at times with no land in sight… the lifestyle of sailors and marine oilers isn’t for everyone, but for those who love life on the water, there’s nothing like it. Sailors—also called deckhands— operate and maintain vessels and deck equipment, and keep their ship in good working order. Sailors stand watch for hazards or other vessels in the ship’s path, and keep track of navigational buoys to stay on course. They clean decks, maintain lifeboats, and paint and patch the ship’s surface. At port, sailors load and unload cargo. 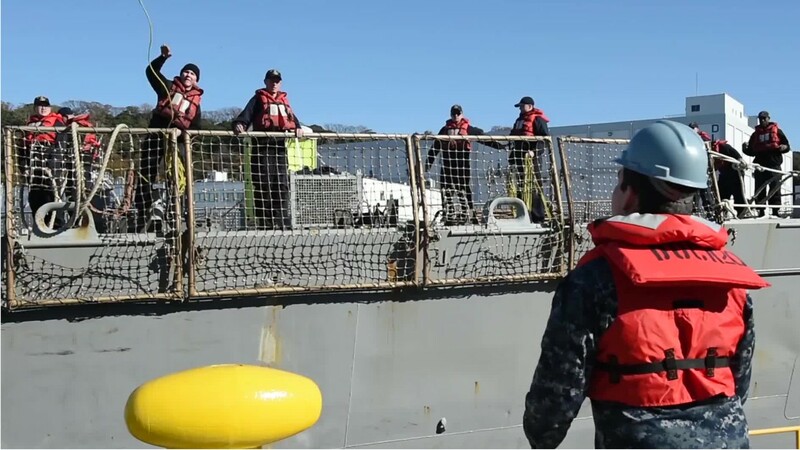 They also steer the ship under the direction of commanders, and handle lines to secure the ship when docking, leaving port, or to connect barges when towed by tugboats. Sailors communicate with other ships using the international signal language of lights and semaphores. Marine oilers are the engine room equivalent of sailors. They help engineers with maintenance and repairs to keep the propulsion system in working order. To load fuel supplies, they ensure hoses are secured and pumps operate correctly. Marine oilers monitor gauges and record data to document changes and that procedures have been followed. Although formal education usually is not required, these workers often need credentials issued by the Transportation Security Administration and the U.S. Coast Guard National Maritime Center. See more details at O*NET OnLine about ship engineers. Ship Engineers by U.S. Department of Labor, Employment and Training Administration is licensed under a Creative Commons Attribution 4.0 International License.